Bandai Namco has uploaded the second trailer for The [email protected]: Stella Stage, which introduces some new features not in the previous game Platinum Stars, as well as introducing a new rival idol character. More detailed new information about the game has also been published by the Japanese news site 4Gamer. As with Platinum Stars, Stella Stage is an idol-producing simulation game where you play as a producer that manages a number of Japanese idol singers and holds live concerts where performances are rated with a rhythm-based gameplay. Stella Stage will add a couple of new features to the management aspect. First of all, Stella Stage will have a new fatigue system. When idols work too frequently, their fatigue will build up, which will cause them to perform worse in their jobs, or even collapse at the worst case, which would cost the producer a turn to let them heal. To prevent collapses from overworking, the producer could opt to either have shift rotations between idols or go on an off-day vacation together with an exhausted idol to also improve relationships. Stella Stage also introduces a Coaching system that can improve idol’s performances and unlock new items. After collecting Coaching Points from holding live concerts, the producer can spend them to move idols on a skill panel where they will learn skills that improve their live performances or unlock new songs, costumes, and accessories that they can use in upcoming live concerts. A brand-new character to The [email protected] universe is also introduced in this trailer. 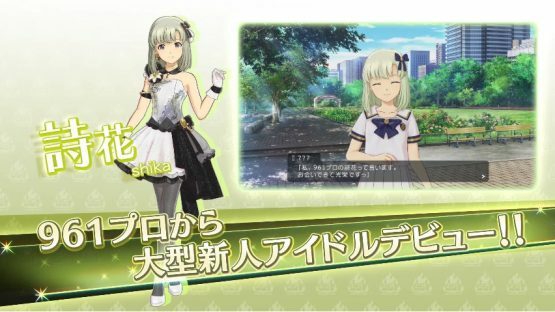 Enter Shika, the new idol debuting from 961 Production, the rival company to the player’s 765 Production. Shika is going to be voiced by Rie Takahashi, and she will also have interactions with the 765 Production idols. And last but not least, 4Gamer has also confirmed that DLC songs, costumes, and accessories from Platinum Stars can be also directly used in Stella Stage without having to buy the same DLC for the new game again. To celebrate this, Bandai Namco will hold a sale of The [email protected]: Platinum Stars DLC with up to 20% discount from October 19 to November 1. The [email protected]: Stella Stage will be released for PlayStation 4 in Japan on December 21. Currently, no English localizations for the game has been announced yet.